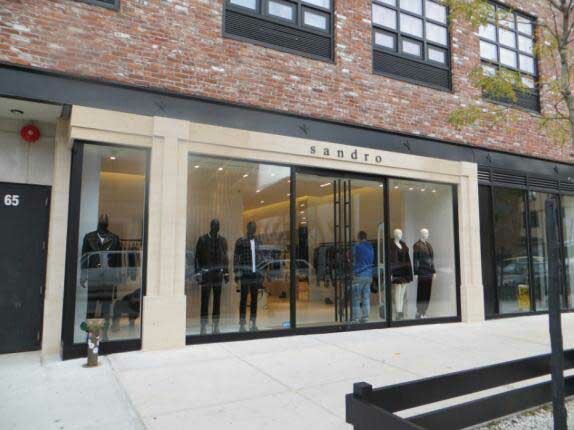 NEW YORK, Dec 12, 2013/ — After its successful opening of its Williamsburg location, Sandro continues to increase its presence in the US with the opening of three new doors across New York and Florida. Sandro opened its sixth New York City based location at 181 Columbus Avenue continued its expansion south, with storefronts in Miami at Aventura Mall that opened on Thursday, November 21st and Palm Beach on Worth Avenue that opened on Friday, November 22nd. All three free standing boutiques will keep in line with the brand’s New Concept design theme, first unveiled in Williamsburg this October. In line with the New Concept Store theme, the three new locations will reflect soft colors that complement the custom terrazzo floor, both made up of a mixture of raw materials including wood and marble. The LED lights will match perfectly with geometric paving stones from the ceiling all tying together to create a luxury environment with Scandinavian style and minimalist modernity. These boutique openings brought a total of 11 total freestanding boutiques in the US, as Sandro has aggressively increased its presence in the U.S. market throughout 2013. The brand plans to open additional boutiques in other key markets by the end of the year. The brand expansion has also included additional Bloomingdale’s stores across the city and has recently added Nordstrom to the Sandro list of retailers.